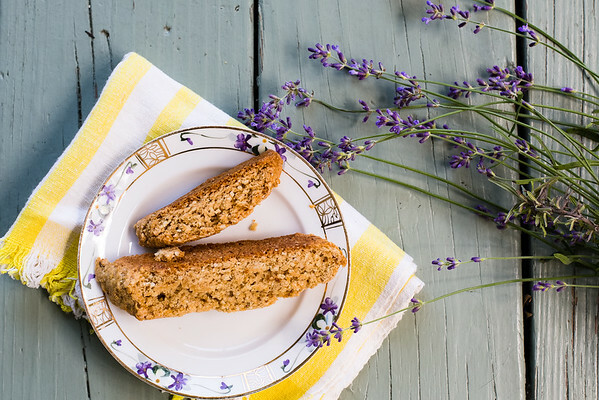 Everyone loves the delicate flavor of the lavender in these Almond Lavender Biscotti! They are low in calories and filled with good for you almonds. Post may contain affiliate links, full disclosure in sidebar. I collect biscotti recipes the way some people collect cat figurines. Well, I also collect cat figurines, but let’s try and ignore my collecting issues, shall we? 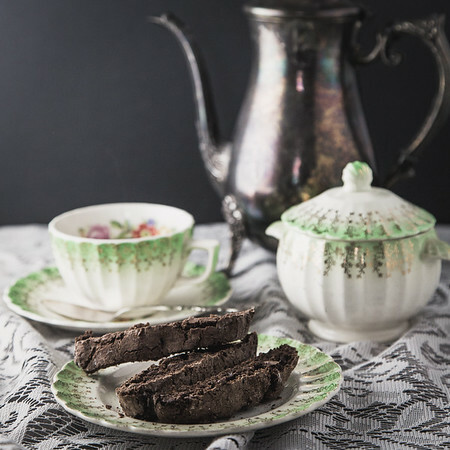 Why biscotti recipes? Biscotti is so easy to bake. It doesn’t have to rise much, stay moist, or be light and flaky, all words that strike terror in my heart. 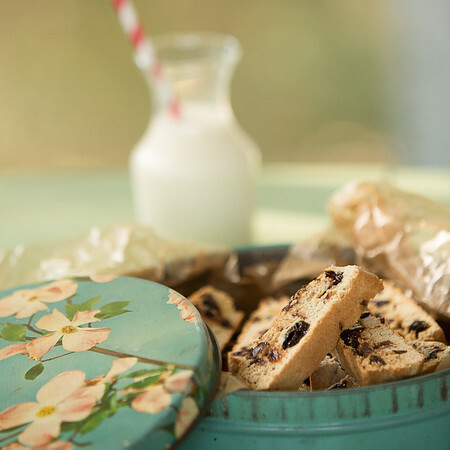 It’s also pretty easy to find low fat and healthy biscotti recipes – always a bonus! 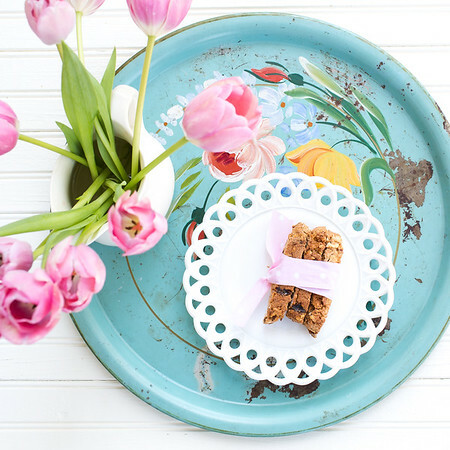 This biscotti is so easy! You process half the almonds in your favorite food processor until they are finely ground. Mix the almonds with the other dry ingredients in a large mixing bowl. Add the honey and water and stir until just combined. Divide the dough into two loaves and bake per instructions. Cool slightly and cut with a serrated knife into 1/2 inch slices and bake again for about 30 minutes. Cool on wire racks. This was wonderful. A soft hint of lavender and with the perfect amount of crunch. I love that the almonds were processed in a food processor to become almost another flour. As a matter of fact, I loved it so much that I processed all of the almonds not the half that was called for. I would like to tell you that I made a conscious decision to do that, but no, it was just me not paying attention to the recipe (see why I don’t bake?!). But since it was the oh-so-forgiving biscotti, it still came out wonderful! I found this recipe in The Food Matters Cookbook from Mark Bittman. 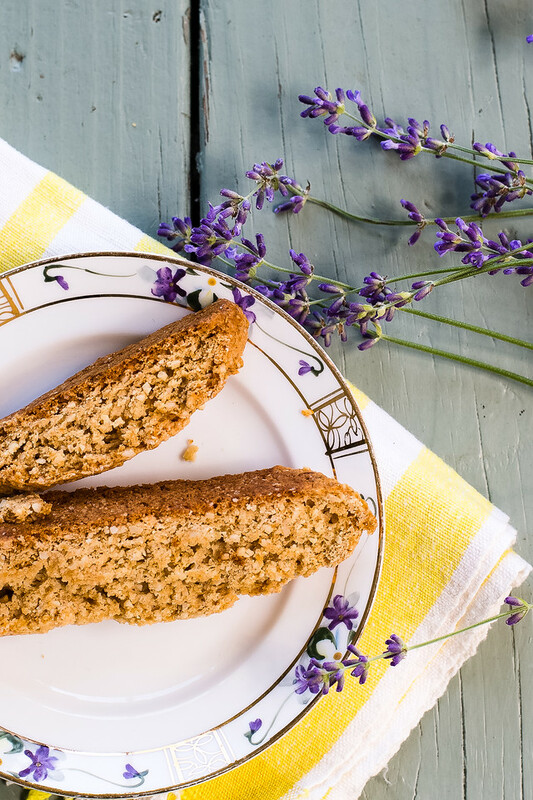 You're going to love how easy and delicious this Almond Lavender Biscotti. Heat the oven to 350. Put half the walnuts in a food processor and pulse until finely ground. Place them in a large bowl with the rest of the almonds, the flours, sugar, baking powder, baking soda, lavender, and salt and mix well. Add the honey and 3/4 cup water and mix until just incorporated. Add a little extra water if needed to bring the dough together. Lightly grease two baking sheets with a little oil and dust with flour (I just use parchment paper and only one baking sheet). Divide the dough in half and shape each half into a 2-inch wide log. Put each log on a baking sheet and bake until golden and beginning to crack on top, 30 to 40 minutes. Cool the logs on the sheet for a few minutes. Lower the oven temp to 250. When the loaves are cool enough to handle use a serrated knife to cut on a diagonal into 1/2-inch slices. Place the slices on the sheets, return to the oven and leave them there, turning once, until they dry out some, about 25 to 30 minutes. Cool completely on wire racks. I’ve never baked with lavender but I’m so intrigued. These biscotti look great! 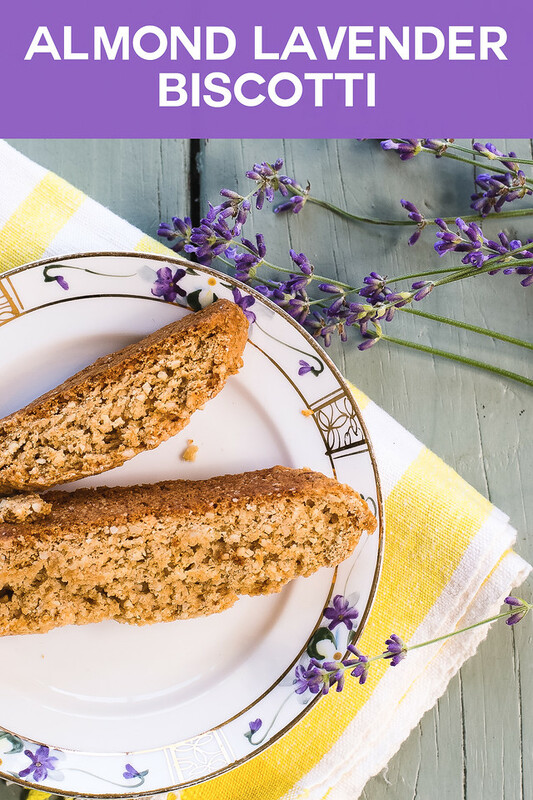 I absolutely love Biscotti, but I’ve never thought to make it with lavender, such a great idea and I can’t wait to try this recipe! Can you substitute with dried lavender? What would be the substitute amount? I usually substitute 1/3 of the quantity of fresh for dried. So, 1/3 of a tablespoon. I’m no baker either, Pam, which is one reason why I have always shied away from making biscotti – I’ve always worried that I would end up with something you could totally break a tooth or two on. Maybe I need to set that nervousness aside and give these a try. I can almost taste it. Your pics are wonderful. I made biscotti years ago. I think I’ll try again and use this recipe. Thanks! Pam, next year you should plan a vacation out to the Sequim Lavender Festival. Brian and I went last year and we loved it! Lavender as a cooking herb? I would never have thought of that. I recently finished a book you might enjoy–Serena, by Ron Rash. Right now I’m reading Amy Falls Down by Jincy Willett. Liking that one, too. Yum. I love making biscotti, too. The perfect housewarming gift! oh so beautiful, i love your pics! What a dainty coffee accompaniment! I wish I had one to dip this morning.